From the Bollywood Media industry, organized the big celebration of Diwali at BOLLYWOOD PARKS Dubai, where starting from DH99, guest can enjoy the different performances, yummy foods, and latest trendy entertainment live performed by Bollywood music celebrities at premier Bollywood-themed park with big hosting. They offer free entry to enjoy this colorful event in BOLLYWOOD PARKS, first 100 visiting guests can avail the chance of free visit there. This big Diwali event will, later on, organize the live performance of Bollywood composers, Shankar-Ehsan-Loy on 9 November 2018 and Neeraj Shridhar on 10TH of November. Guest can enjoy the movies by Zee Studio international screened at the Raajmahal Theatre and can enjoy the yummy foods by festival offering across India. All the performances and events the ‘Big Zee Diwali Festival of Lights’ can enjoy by the normal ticket price. Director of marketing and sales, Moira Casey stated: "BOLLYWOOD PARKS is transforming into a dazzling destination with some of the most thrilling rides, shows, and films that celebrate the color and festive spirit of Diwali. The two-day event will treat food-lovers to unique Indian food at a bustling food festival and also showcase stunning fireworks display on Friday the 9th. We encourage residents and tourists to come down to BOLLYWOOD PARKS and discover a truly spectacular Diwali celebration in Dubai." COO of the Zee Entertainment Middle East Manoj Mathew, in additionally said: "Zee Network is excited to be hosting its International IP, Big Zee Diwali with Bollywood Parks Dubai. We can expect this to be a celebration to remember. Reaching out to over 20 million people through our South Asian and Arabic television channels, 106.2 Big FM and social media platforms, Bollywood Parks Dubai will be the perfect place to enjoy Diwali festivities with family and friends." 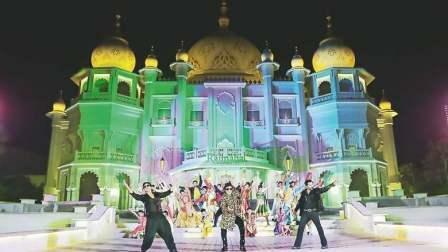 BOLLYWOOD PARKS Dubai has also organized the live street performance at the base of the brand-new line-up, filled with energetic music, songs and dances which will be shown during Diwali celebration. All guests can fascinate themselves by the live performance, songs dance by the celebrities and will enjoy the street foods including folks’ dances and magic shows and Bollywood-themed acts. All can enjoy at normal price ticket.